Well, I’m finished my Korean chapter. My last day of teaching was Thursday and it went pretty smoothly. Some of my students made cards for me and a few gave me small gifts. So that was nice and it made me feel like I’d made some kind of impact. But then one of my more advanced students wrote “You will go back to Kanada now.” So . . . maybe not that big of an impact. The other teachers got me a cake and we had a little goodbye gathering before they went to teach the rest of their classes for the night (I only had three classes on Thursday.) I’ll really miss a lot of the people I worked with and a lot of the students. For the most part, however, I’m glad to be done the contract and able to move on to new adventures. I was really hoping to see a monkey and was somewhat successful. We saw a monkey when we were in the van. 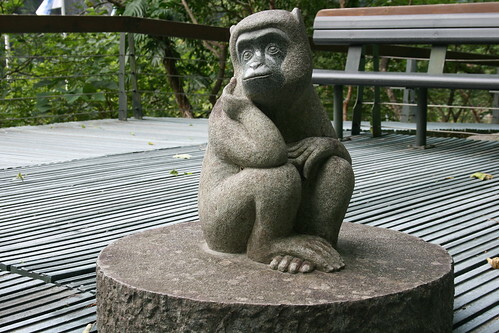 Also, there was a statue of the Macaque at the visitor’s centre. It wasn’t an up close encounter, but I guess it might have to do. The closest I got to having my camera stolen by a monkey. Some day . 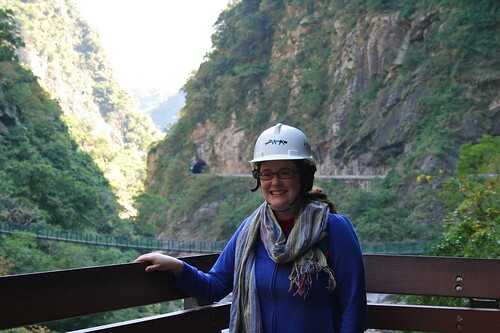 . .
Now I’m in Tainan, where I spent the day touring some cool and some not-so-cool historical sights. But more about Tainan later . 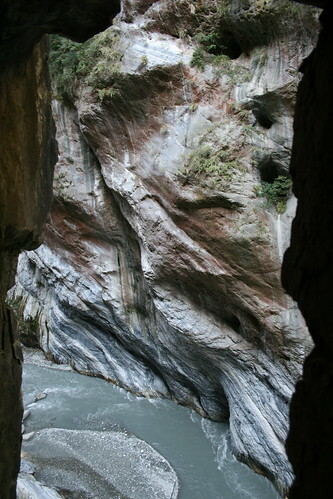 I’ll leave you with a view of the Shakadang River, as seen through the holes in the walls of Taroko Gorge. The gorge looks gorgeous. Love that your student wrote Kanada. What did you do to celebrate your birthday? Mom, I promise to be careful around any primates. Although I still think that humans are the most dangerous of the bunch. Devon, I pretty much just celebrated my birthday by leaving Korea. That was enough for me!